This residence is a good and generally intact example of the Craftsman style. 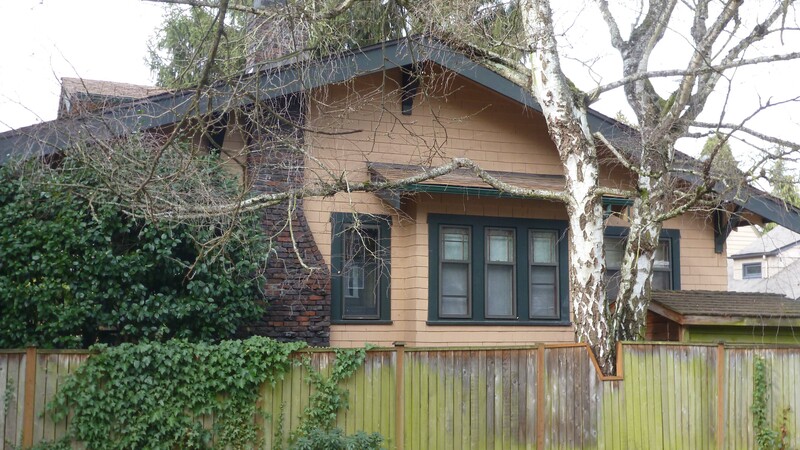 It is associated with early 20th century development in the Montlake area and is a contributing resource to the Montlake NRHP Historic District. The earliest known owners of this house were Harold A. (Ruth) Wooster in 1938; he was a clerk for the North Coast Transportation Co. The owners in 1948 were Cecil J. & Nina Dunham; he was a Seattle Public School teacher. Hugh T. & Ann Gibbons owned the house in 1958. Montlake is generally described as extending from the Washington Park Arboretum west to Portage Bay/15th Avenue E., and from the Montlake Cut on the north to Interlaken Park. The area is a significant and cohesive collection of residential architecture typical of early 20th century Seattle and is eligible as a NRHP historic district under Criterion C. Construction occurred primarily between 1910 and 1940, with a variety of Craftsman and revival styles ranging from modest cottages and builder's houses to high-style architect-designed residences, impressive institutional buildings, and notable parks and natural features. There are few intrusions of newer buildings. In the early 1960s, construction of SR 520 and the unfinished R.H. Thomson Expressway bisected Montlake, but the neighborhood retains its basic integrity as a pre-World War II Seattle neighborhood. Montlake was incorporated into the City of Seattle in 1891. Although the first plats (Union City 1st and 2nd additions) were filed by Harvey Pike in 1869-1871, development did not really begin until plats were filed by John Boyer (Interlaken, 1905) and H. S. Turner (1907). Montlake Park (north of SR 520) was platted in 1909 by the developers James Corner and Calvin and William Hagan. With the 1909 Alaska-Yukon-Pacific Exposition came a streetcar line on 24th Avenue E. and an impetus for development. In 1916, the Lake Washington Ship Canal was completed and the Montlake Bridge linked the neighborhood to the university area in 1925. A small commercial district grew along the car line. The 1903 Olmsted Parks and Boulevards Plan of 1903 surrounded Montlake with parks. Montlake Boulevard (then call University Boulevard) connected Lake Washington Boulevard to the A-Y-P grounds. Washington Park, the eastern boundary, was acquired by the City in 1900 and developed as an arboretum in 1936-41. At the southern edge is steep, forested Interlaken Park and boulevard. By 1915, the neighborhood had developed enough to require a temporary school building; the permanent structure opened in 1924.Soon afterwards came a playfield and shelter house (1933-36) and a library (1944, replaced 2006). Other noteworthy structures include the Seattle Yacht Club (1920), the NOAA Northwest Fisheries Center (1931), the Museum of History and Industry (1952) and St. Demetrios Greek Orthodox Church (1962). King County Tax Assessor Records, 1937-2014. Becker, Paula. Seattle Neighborhoods: Montlake--Thumbnail History. HistoryLink File # 10170, accessed 12/2/2013. Smith, Eugene. Montlake: An Urban Eden, A History of the Montlake Community in Seattle. La Grande OR: Oak Street Press, 2004. This 1.5 story house is rectangular in plan, is shingle clad, and has a side-gabled roof. The house sits on a corner lot behind heavy shrubbery and fencing. The house exhibits classic Craftsman details including exposed rafters, braces, and vergeboards; overhanging eaves; an expansive front porch; gabled dormers; and natural materials. Windows include single, double, and triple bands of double-hung wood sash behind storm windows. An exterior brick chimney is on the east wall.